Ashton Gowadia talked to reporters briefly yesterday outside the Prince Kuhio Federal Building after visiting his father, Noshir Gowadia, who is in federal custody accused of selling top-secret B-2 stealth bomber technology to foreign countries. The son of an engineer who helped design the B-2 stealth bomber says his father is innocent of selling classified information to foreign government. "The man bleeds red, white and blue for this country, and he's done a lot of things that have saved a lot of American military lives," Ashton Gowadia, eldest son of Noshir Gowadia, said yesterday. Noshir Gowadia was arrested and charged Wednesday under federal espionage statutes. FBI officials say he has signed a confession in which he acknowledges selling B-2 secrets to eight foreign countries. But Ashton Gowadia said he is confident that when the truth comes out, his father will be exonerated. "I understand the government's position right now because right now we're at war, and so you have to be careful -- you have to check out everything," Gowadia said. "But in this case, I'm very confident that he's innocent." U.S. Magistrate Barry Kurren ordered a slightly rumpled Noshir Gowadia, 61, of Haiku, Maui, held without bail yesterday. Gowadia, a Maui resident for the past six years, worked as a design engineer for Northrop Corp. from November 1968 to April 1986 and has called himself the father of the infrared suppression technology that helps protect B-2 bombers from heat-seeking missiles. A complaint filed Wednesday in U.S. District Court accuses the naturalized citizen from India of disclosing classified national defense information to foreign governments and of being paid for his assistance. Prosecutors say that Gowadia gave a statement to investigators on Oct. 14 in which he allegedly admitted he did so to help other countries improve their aircraft defense systems, that he knew it was wrong and that he did it for money, according to a court affidavit. 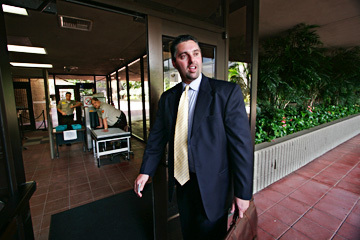 Assistant U.S. Attorney Ken Sorenson argued in court that Gowadia poses a danger to the community because of the "vast amount" of knowledge of national security and classified information he possesses, including information found on computer hard drives at his Maui home. Found on one computer alone were 14,000 files that are of concern to the U.S. Air Force, Sorenson said. It is not known whether Gowadia kept other copies of these files at other locations or with other individuals in other countries who might be capable of distributing them, he said. Their investigation has revealed that Gowadia routinely traveled internationally and has contacts in foreign countries because of his work. He also has businesses in countries including Australia and Switzerland. If Gowadia is not detained, there is a danger that classified information could be disseminated, Sorenson said. Assistant federal defender Donna Gray argued that the government cannot rely solely on the facts and circumstances of the case to detain Gowadia, who must be presumed innocent and is not charged with a crime of violence or drug trafficking. She argued that conditions can be imposed to allow him to be supervised on Oahu, including restricting his communications. Kurren found that Gowadia poses a serious flight risk based on his foreign contacts and extensive travel over the years and poses a danger to the community if he engages in the activities alleged in the affidavit. Gowadia's personal safety is also a concern, Kurren said. Also, while the Gowadias appear to have substantial assets to post a security, the assets might be subject to forfeiture based on the allegations, he said. "In light of these serious allegations, foreign ties -- it's too early to consider any proper conditions for release," Kurren said. Federal prosecutors declined to comment on Ashton Gowadia's out-of-court statements. Gowadia's son said most of the allegations cited in the criminal complaint against his father are "false," calling the situation a "misunderstanding that's blown way out of proportion." He could not divulge details, saying he did not want to hurt his father's case. "This man is a hero to this country," he said. "I can't wait for the facts to come out." Gowadia said his father's situation has been difficult for his family, which he described as "very patriotic." "It's very difficult because you have the media here, and everybody, when they read this stuff, they say, 'Oh my God, what has this guy done?' -- but it isn't anything like what they said." Gowadia, who met with his father after the hearing, said his father is doing fine. "He knows it's going to get cleared up." His father has the support of many individuals in Washington and at the highest echelons of the U.S. military who are thankful for what he has done for this country, he said. As for his father's safety, Gowadia said his father's life has been in danger for the past 30 to 35 years. "He's risked his life for this country. That's what they don't understand ... the things he's done for our country -- he's always in danger."